Sinabung is an active volcano found in Indonesia. Mount Sinabung, or Gunung Sinabung in Indonesian, is an active volcanic mountain that is situated in the largest island country of the world, Indonesia. The country sits on the 'Pacific Ring of Fire' which is infamous for frequent volcanoic eruptions and earthquakes. Of the 400 volcanoes, 130 of them are active, including Mount Sinabung. Mount Sinabung is located in the Karo Plateau in Karo Regency of North Sumatra, Indonesia. The Lake Toba Supervolcano is some 25 miles from Sinabung. 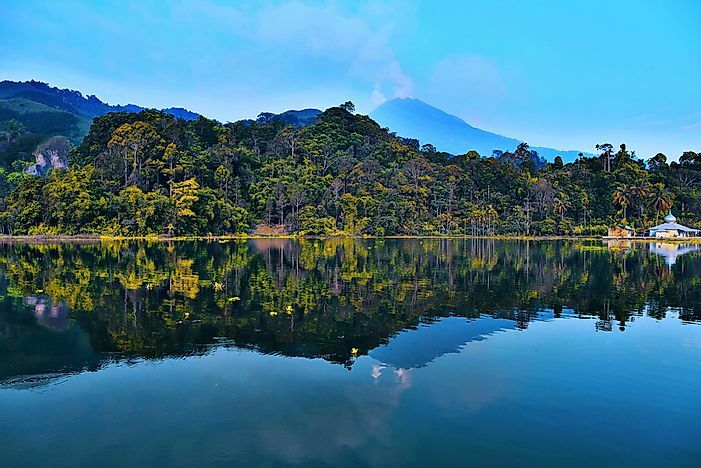 Mount Sinabung is classified as a Pleistocene-to-Holocene stratovolcano. Furthermore, the mountain stands at a height of 8,071 feet and is considered as one of the most dangerous and most active volcanoes in Indonesia. On the sides of the mountain, there are several lava flows that have solidified. The presence of an active volcano is naturally detrimental to any ecosystems due to the high temperatures of lava and layers of ash after an eruption. For example, the estimated temperature of previous eruptions of the mountain were around 1300° Fahrenheit. As expected, these temperatures kill a lot of life. The few that survive after an explosion end up dying due to a lack of resources. However, species might be reintroduced into the system from things like migration or small groups of surviving species. An example of such a case where a species recovered was after the eruption of Mount St. Helens in Washington, USA. Prior to 2010, the volcano had been dormant. In fact, the last known eruption before 2010 was back in 1600. Some activity where lava, steam, and gas were emitted at the summit was observed and recorded in 1912. In 2010, after the protracted break, Mount Sinabung erupted and has been active since. On August 29, 2010, a minor eruption occurred after the volcano was heard rumbling for days. Ash was thrown up at a distance of around 0.93 miles and lava was observed as well. More than 6,000 villagers had to be evacuated on 31 of the same month. In the same year, two other eruptions were observed on September 3, 2010, forcing more villagers to evacuate. The people in the area had a brief reprieve from volcanic activity until September 15, 2013, when it erupted. Around 3,700 people were evacuated after the volcanic material traveled within a radius of 2 miles. Further eruptions were also noted in November and December (which led to the formation of a lava dome) of 2013. 2014 also witnessed eruptions in the months of January, February, and October. During that year there was considerable damage to property as well as loss of human life. Further lives (at least seven) were lost on May 22, 2016, a year which saw plenty of ash plumes. Further eruptions happened in 2017 on August 2 with activity spreading to 2018. On February 19, 2018, large volumes of volcanic material were released by the volcano necessitating the evacualtion of about 30,000 people. Fortunately, there was no recorded loss of life. Which Four Presidents Are On Mount Rushmore? When Did Mount Vesuvius Erupt?